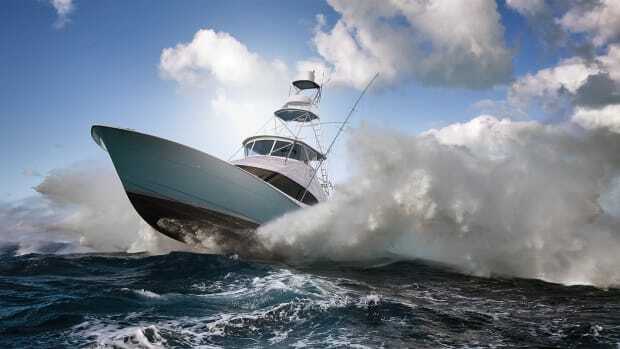 The first-gen 58 made Viking into the sportfishing behemoth it is today. The new 58 continues that tradition. The first-gen 58 made viking a sportfishing dynamo. today’s model continues their unyielding pursuit of perfection. The dancer, clad in dolphin blue, went for broke on a moodily lit, Atlantic City stage. She launched into a full-out sprint and then—slowly, deliberately—held her position. A quiet determination and sturdiness belied her movements, as she advanced backwards with grace and velocity. To finish off the powerful performance, she executed several fleet-footed pirouettes before again darting off. It was a bewitching display by a finely tuned athlete. I’ve seen some memorable shows in Atlantic City and this one was a real humdinger. This time, however, the stage was a rumpled Absecon Bay and the dancer was the Viking 58 Convertible. Prior to witnessing the 58’s moves, we pushed off into the gray day and brackish waters of Edwin B. Forsythe National Wildlife Refuge. Hurricane Florence was slated to make landfall the next day in the Carolinas and deteriorating conditions were showing the storm’s size. The wind blew at a steady 20 knots. Then came a surprise. Looking east, 8- to 10-foot waves peeled through the shallows in sets. I expected to see surfers, as the rollers held their shape before crashing onto shoals that appeared to be in the middle of Absecon Inlet. With our 5-foot draft, it was clear that low tide and conditions made the inlet unpassable. Otherwise, from what I learned about her pedigree and construction, I’m confident we would’ve punched through with aplomb. I took this all in from the comfort of the neat, commodious flybridge. 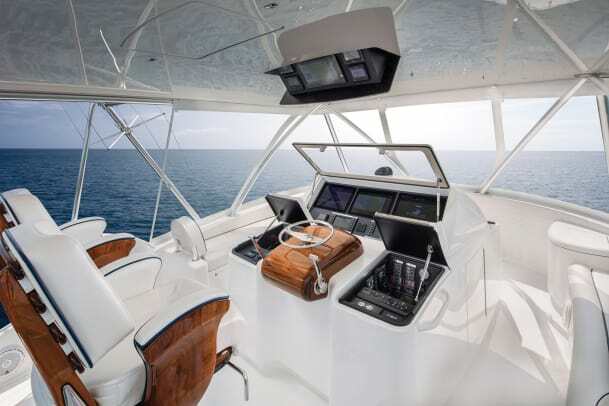 There were four of us, and the gleaming white space could’ve fit a half-dozen more on lounge seating that flanks the walkaround, center-console-style helm station on three sides. 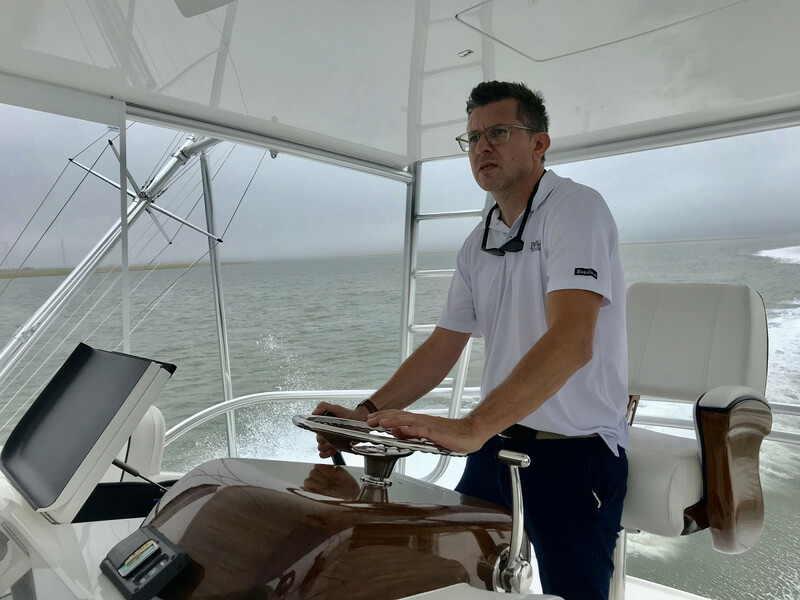 I was awaiting my turn at her teak helm pod as Scott Adams, Viking demo captain, leaned against the bolster on the Release Marine helm chair and put the 58 through its paces. 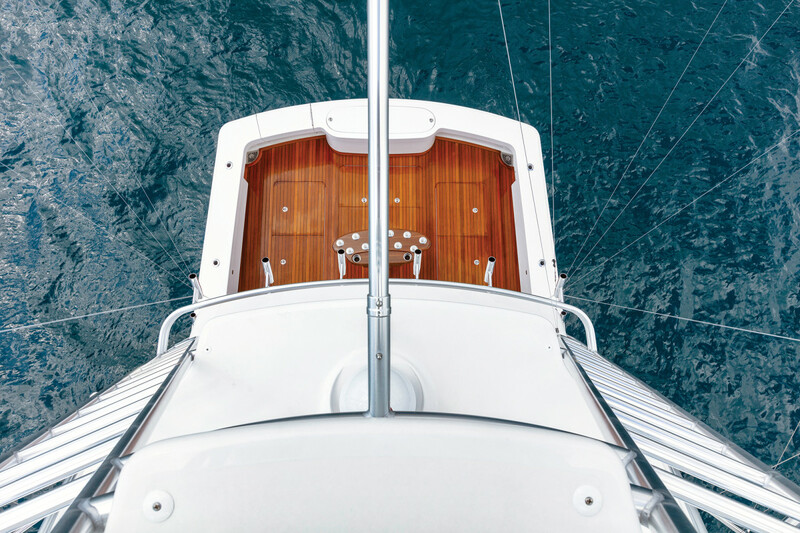 Dressed to kill: A view from the tuna tower of the teak-decked, 165-square-foot cockpit, ready for pelagic battles. Adams deftly handled the single-lever controls and the 58 spun on her own axis. “We outperform, out service and out engineer the competition,” he told me when I asked about his time at Viking. 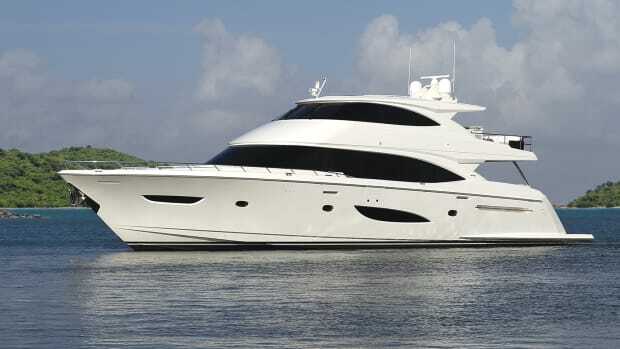 He was slated to run this boat south and fish the 58 all winter out of Palm Beach as a demo boat. 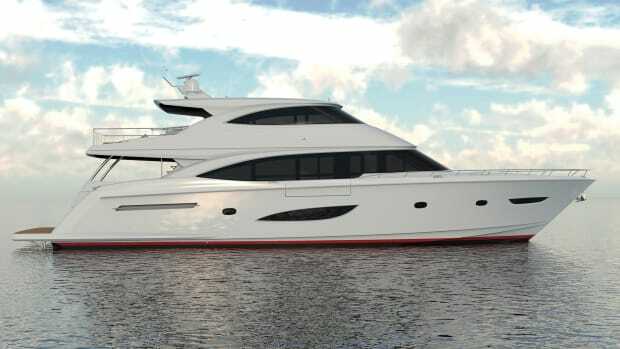 Like all of its new convertibles, the 58 will serve Viking in two distinct ways. 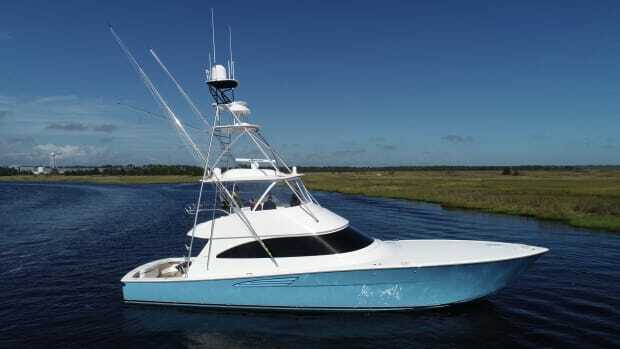 She’ll chase gamefish with a crew comprised of Viking employees, earning them some well-deserved R&R and a chance to get on board their creation. But what they bring back will energize and inform the next generation of Viking vessels—what they learn on the water has proven to be invaluable. “We spend 1,000 hours a year on demo boats. In that process, it’s unbelievable what you get back,” Viking CEO and President Pat Healey told me after I had taken a tour of the company’s New Gretna facility. The first 58-foot convertible was built here and helped solidify Viking’s reputation as a builder of premier battlewagons; from 1991 to 2000, they sold 110 of the first-gen 58s. I wanted to know how the company has evolved since then. I met a few of these longtime Viking employees during my plant tour, a small city of buzzing CNC machines, massive paint booths and assembly lines of Vikings in all stages of completion. “We’ve come so far in the styling for a smoother, cleaner, sleeker look,” said Lonni Rutt, vice president of design and engineering. Frank Uhl, supervisor of subassembly and the joinery shop also stopped to chat; he added that rounded corners have made for a cleaner, more updated interior design. “A lot of what we’ve done today, there’s [just] so much more shape,” Rutt said, echoing Uhl’s remarks. 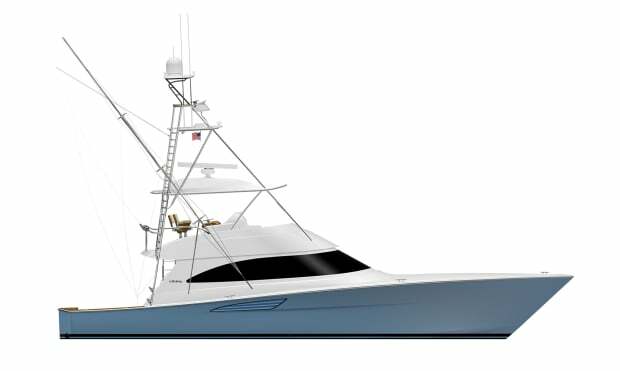 Like Healey, Rutt is driven by both chasing billfish and building boats. He said that old 58 “had a lot of hard corners” and when I mentioned my appreciation for the roomy, orderly engine room on the new 58, I was surprised to learn the old boat had a larger one. “We’ve balanced out the accommodations,” Rutt said, adding more living space, more spacious accommodations belowdecks and a larger cockpit with a mezzanine. The plant tour gave me an intimate glimpse into how the boats have earned a reputation as battle-tested, bluewater machines. 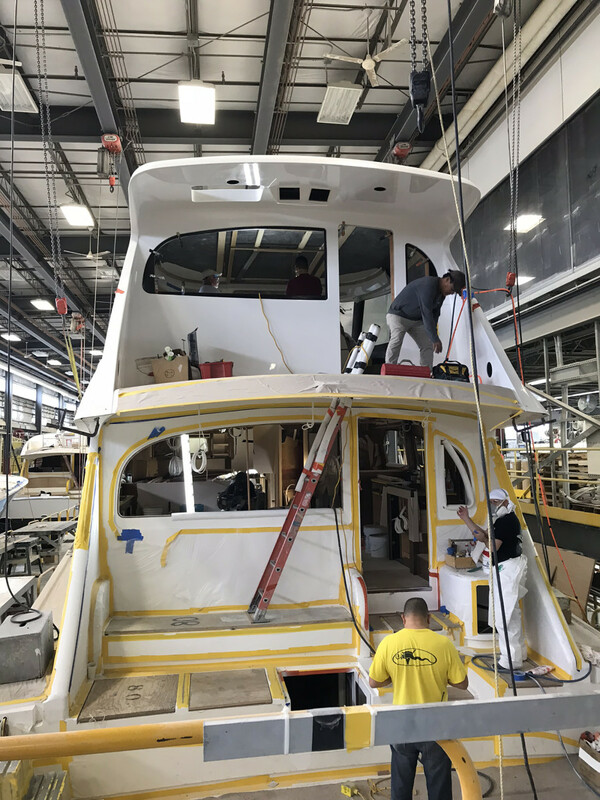 I went up and down the assembly line—a good way to describe Viking is a semicustom builder on a production schedule (they built 80 boats in 2018)—and noted a dedicated workforce and impeccable construction techniques. 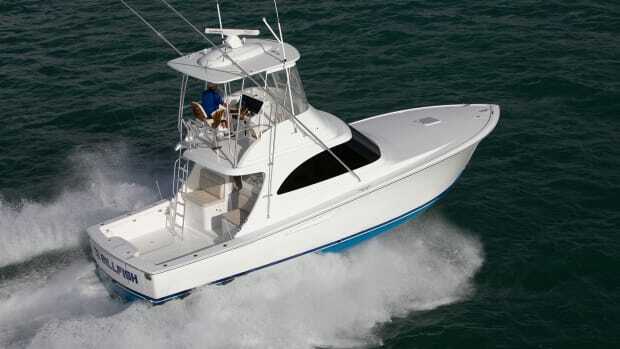 I saw the beefy stringer systems and watched as hulls and bulkhead comprised of a carbon fiber-fiberglass hybrid were fully resin-infused, resulting in a strong hull with a superior weight-to-strength ratio. “Light and strong is the linchpin. [Every] component is the most efficient to go into that boat,” Rutt told me. 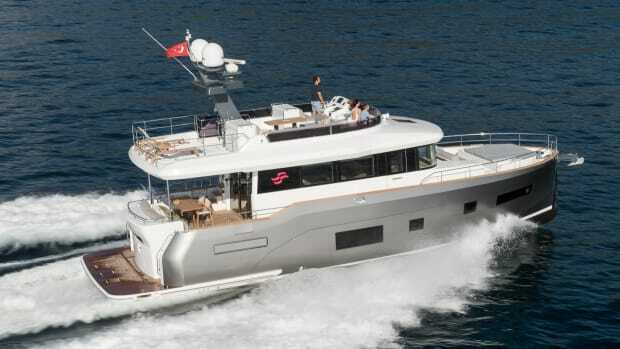 For example, there was more than enough space in the engine room for two, 21.5-kW Onan gensets, but the 58 has one. An onboard 700-gpd, Sea Recovery watermaker means the crew will not have to worry about trips to port to top off the water tanks. And I noted just below the teak-lined cockpit sole a Seakeeper 9—not a larger Seakeeper 16, which could’ve easily fit—squatted in the lazarette that will help to slow the roll as well. Owner-operator friendly features don’t come at the expense of quality. 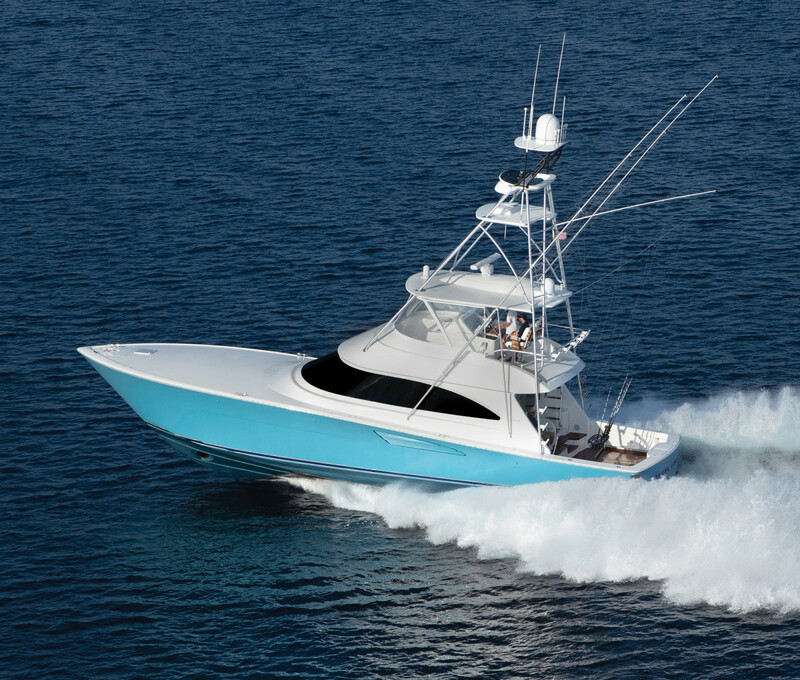 The level of fit and finish aboard the 58 remains first-rate, a clear reason why Viking is an alpha in its class. 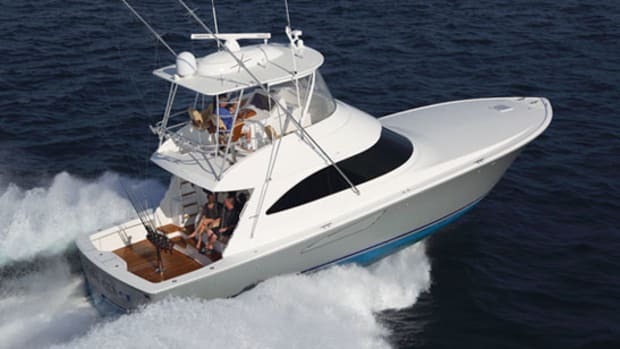 Its 165-square-foot cockpit is like a master study in pelagic battle, the ideal mélange of comfort and fishy features: Four fishboxes (one that converts to a livewell), refrigerated bait boxes, drink coolers and freezers built into the mezzanine stairs are just a few of its attributes. I saw more of Viking’s attention to detail after I pushed the button next to the mezzanine seating and the pocket door slid away offering access to the salon. I had a clear view on centerline to the companionway that would take me to her three staterooms belowdecks; this arrangement—and 7 feet of headroom—worked to give the salon a more open feel. I also took in the exquisite, high-gloss walnut interior. The salon was equipped to serve crew in fine comfort—with high-end appliances from Sub-Zero and Miele, a 50-inch recessed TV matched to KVH TracVision and DirecTV and enough stowage for a week’s worth of sundries for a half-dozen hungry anglers. Back to her enchanting performance. The ease with which she reached her optimum cruise of 33 knots (Hull No. 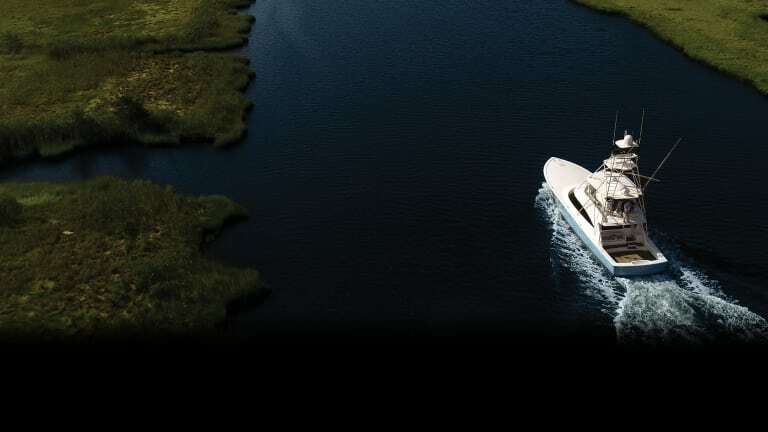 1 had the optional 1,600-hp MTU 10V2000 M96 diesels; there are engine options from MAN up to 1,900-hp apiece) on her way to a top speed of 42 knots was impressive. When it came my turn at the well-organized helm, I noted that sightlines were unimpeded all around, the bridge ideally located to run the boat safely and easily communicate with the action in the cockpit. Hard turns were met instantaneously, as she came around fast and clean. A lithe performer, she behaved and responded like a smaller boat and a seasoned thoroughbred. 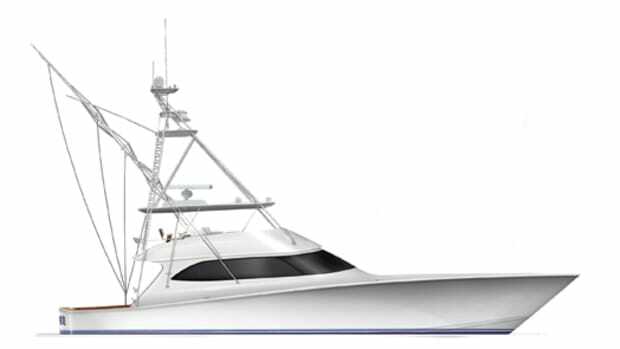 Viking has earned their place in the industry by continually setting the trend with their design applications. “We’ll always push the envelope,” Healey assured me. After all, in modern dance, there are no rules. 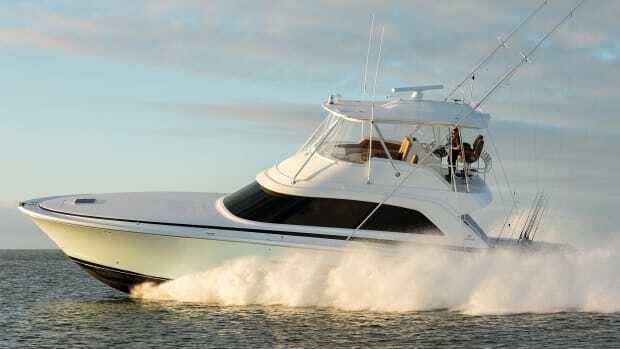 Test Conditions: Seas: 3-4 ft.
Load: Full tank fuel & water, 4 people on board. Speeds are a two-way average recorded by a Garmin multifunction display. GPH taken via MTU engine display. Sound levels measured at the helm. 65 dB(A) is the level of normal conversation. Range is based on 90% of advertised fuel capacity.